The Macron East Sussex Football League is desperate for an improvement in the weather as its tally of postponements approaches three times the figure of last season. Just two league matches and four cup ties went ahead last weekend as the extended winter continues to play havoc with the fixtures. Battle Baptists and Crowhurst contest an aerial ball on a bitterly cold afternoon at Crowhurst Recreation Ground. Some 230 games have now been postponed during the current campaign, compared to just 81 in the whole of last season. Fixture secretary Kevin Bray said: “It’s not the worst season ever, but it’s getting that way. Some teams have only played one game since December. The last nominated day for the league season is Saturday May 5, but the programme may go on until the Bank Holiday Monday two days later. A Battle Baptists player tries to turn past a Crowhurst opponent. Hastings Borough Council has extended the last day for using its pitches by a week to Saturday April 28. Matches will be scheduled for Easter Monday and teams who have still got more than eight games to play are likely to face midweek fixtures. There may also be one or two ‘double headers’, although there aren’t many instances where teams in the same division haven’t yet played each other. Completing cup matches is the main priority at the moment. Although some semi-finals have been played in the various knockout competitions, there are still several quarter-finals and even one second round game still outstanding. Most of the cup competition organisers haven’t yet announced dates for the finals as a result. The worst affected clubs include Crowhurst, who are yet to reach the midway point in the Premier Division programme, and Bexhill AAC and Sovereign Saints, both of whom are only halfway through their league games and are still going in more than one cup competition. Clubs are trying their best to get games played. The venues for a number of matches have been switched or played at a neutral ground just so they can be completed. Last weekend’s schedule wasn’t helped by the pitches at Bexhill Road being fit, but the fixtures due to have been played there still being postponed as a result of the road closure. Of the action which did take place, Division One promotion hopefuls Bexhill AAC lost 5-1 to Division Two high-flyers Sovereign Saints in a Sussex Bluefin Junior Challenge Cup semi-final switched to Buxton Drive. Saints led 2-1 at half time before three unanswered second half goals put them through to a final showdown against Whyke United on Wednesday April 4. Darren Witham’s penalty was all AAC had to show for their efforts. Battle Baptists booked their place in the semi-finals of the Hastings & District FA Intermediate Cup with a 4-0 victory over Crowhurst. 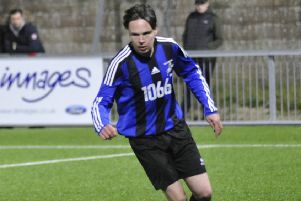 In a quarter-final tie switched to Crowhurst, Ollie Jeffs gave Premier Division leaders Battle a half time lead before substitute Dean Boyd (2) and Glen Carrick netted in the second period. Battle will host title rivals Hollington United in the last four. Division Four side Cranbrook Town edged out Division Five leaders Sedlescombe Rangers III 3-0 on penalties to reach the Hastings & District FA Lower Divisions Cup final. The game itself had finished 3-3 at the end of normal time and 4-4 after extra-time. Sedlescombe came from 2-0 down to lead 3-2 and Cranbrook had a player sent-off, but scored a penalty to force the additional half-hour. Cranbrook then went 4-3 up only for Sedlescombe to equalise. Tom Adams, Philip Hatch and Simon Mitchell scored Sedlescombe’s second, third and fourth goals after an own goal opened their account. Victoria Baptists, from Division Three, won 2-1 at home to Division Four outfit Sovereign Saints II to reach the Eastbourne FA Vice-Presidents Cup final. As for the league, Robertsbridge United won 5-0 at home to Ore Athletic to move up to fourth in the Premier Division. In a match moved to Sandhurst, Michael Stone and Curtis Coombes netted twice each before Austin Galea completed the scoring. In Division Five, fourth-placed Icklesham Casuals II won 4-1 away to AFC Hollington in a game moved to Helenswood Sports Centre. Michael Taylor netted Hollington’s consolation.